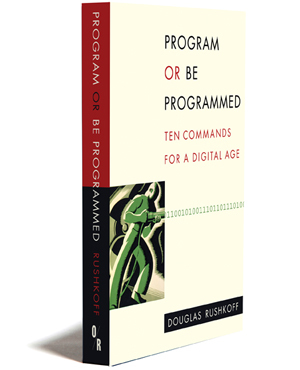 Winner of the first Neil Postman award for Career Achievement in Public Intellectual Activity, Douglas Rushkoff has written a dozen best-selling books on media and society, including Cyberia, Media Virus, Coercion (winner of the Marshall McLuhan Award), Get Back in the Box, and Life Inc. He has made the PBS “Frontline” documentaries Digital Nation, The Persuaders, and Merchants of Cool. A columnist for The Daily Beast and Arthur Magazine, his articles have been regularly published in The New York Times and Discover, among many other publications. His radio commentaries air on NPR and WFMU, his opeds appear in the New York Times, and he is a familiar face on television, from ABC News to The Colbert Report. Rushkoff has taught at New York University and the New School, played keyboards for the industrial band PsychicTV, directed for theater and film, and worked as a stage fight choreographer. He lives in New York State with his wife, Barbara, and daughter Mamie.